While it’s just one stock, the market was actually pretty resilient in the face of Facebook’s (NASDAQ:FB) dreadful earnings reaction. That said, a number of names are struggling right now after what many expected to be a great earnings season. Let’s see how some top stock trades are shaping up heading into Friday. Is it any surprise we’re beginning the piece with Facebook? While the company beat on earnings estimates, it missed on revenue expectations. Even worse, management painted a terribly dire situation on the conference call. It’s almost as if they wanted the stock to be hammered into oblivion. In any regard, this massive $500 billion market cap company shed about 20% on Thursday. So where to from here? 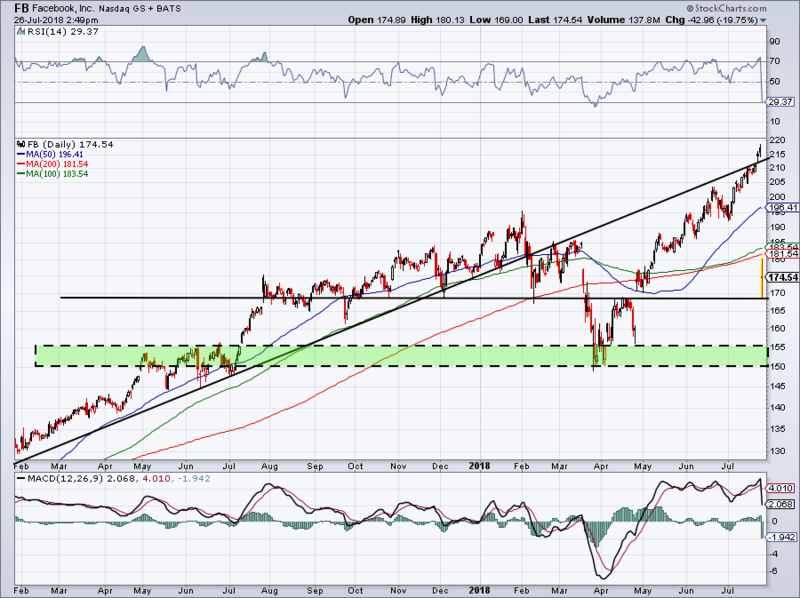 It’s no surprise FB stock found support just under $170. That said, it better hold. If not, the possibility of falling back down to that $150 to $155 range is back on the table. While Facebook’s fundamentals appeared strong before Wednesday evening, the snapback proved to be too much, too fast. Unlike its FANG brethren Netflix (NASDAQ:NFLX), Facebook didn’t get a generous rebound. See how shares handle Thursday’s range. Above the highs and short-term investors can go long. Below and a drop down to its prior lows are on the table. The reaction to Ford (NYSE:F) wasn’t any more inspiring than FB. Shares tumbled 6% in what was a not-so-surprising reaction given the earnings results out of General Motors (NYSE:GM) the day before. Hopefully InvestorPlace readers were able to sidestep the pain, given that we said investors shouldn’t bite on Ford yet. Now just below that mark, F finds itself clinging to a vital area near $9.90. Below here and Ford stock could find itself in no man’s land. The 6% dividend yield is doing little to help and if investors want a more dependable yield, they may want to consider AT&T (NYSE:T) instead. Ford unfortunately is not looking good. New buyers can justify a long position with a short leash, but a bounce beyond $10.50 is looking quite difficult at the moment. Another name on the cusp of worry? 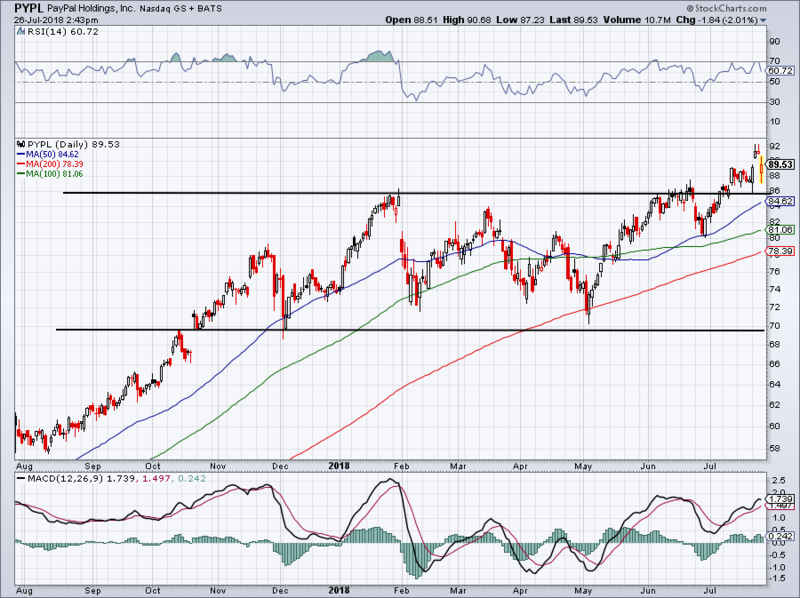 Raytheon (NYSE:RTN). Despite beating on earnings and revenue, investors were quick to smack this one lower. At one point, RTN broke below key $190 support. 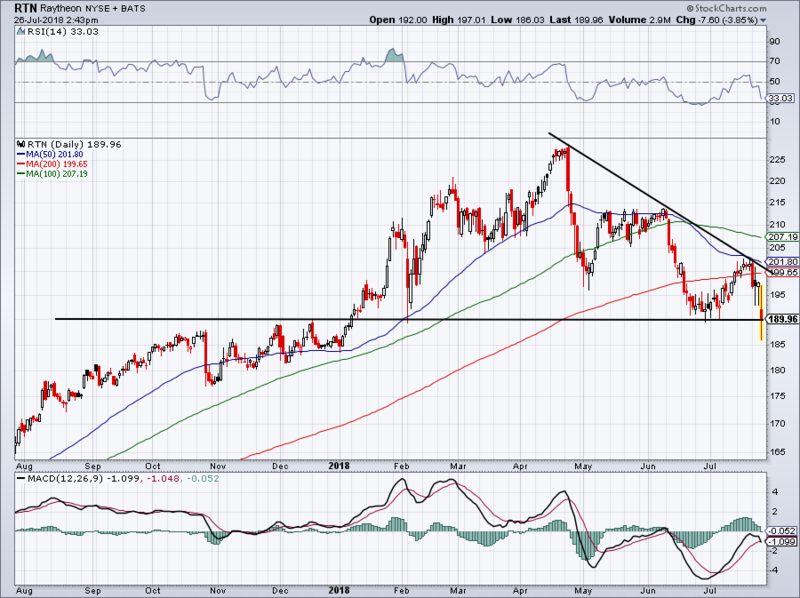 With a stiff downtrend line in place, Raytheon is becoming a concern despite its strong fundamental story. Like Ford, InvestorPlace readers were again spared of the downside. Below $190 and there’s no reason to be long this defense stock. 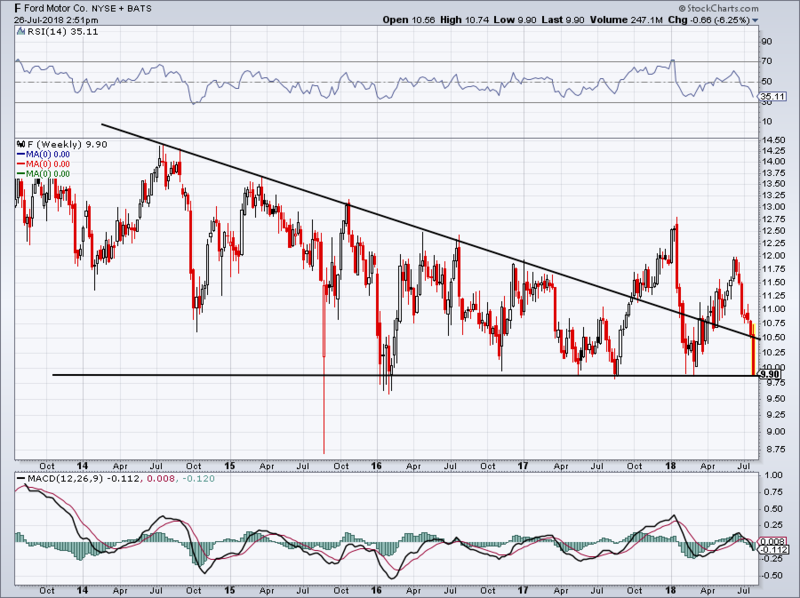 Should $190 hold and shares bounce, look to see how it handles downtrend resistance. Failure to break through this mark (and thus the 50-day and 200-day moving averages) increases the likelihood that $190 support fails in the future. If that happens, Thursday’s lows, at a minimum, are the target. Under Armour (NYSE:UA, NYSE:UAA) was able to climb about 5% after beating on revenue expectations and reporting in-line earnings results on Thursday. However, shares were not able to hold onto the strong gains that it had at the start of the session. Now just below $22, bulls longing to buy the stock should wait for a close over this level. The rationale is simple. 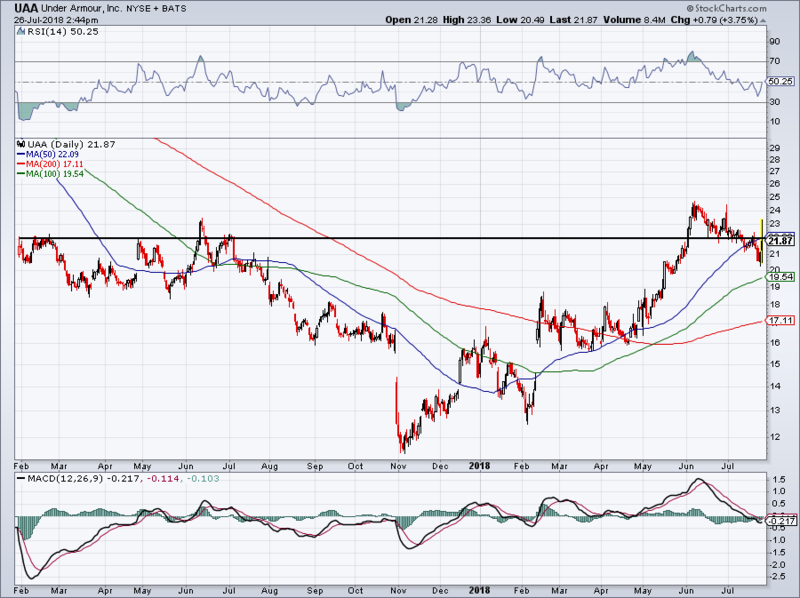 $22 has been a tough layer of resistance for some time. Further, the 50-day has played a notable role in UAA’s price action over the last two years. Both marks sit at the $22 level. If UAA is able to hurdle that mark with authority, something it did in the beginning of Thursday’s session when it ran to $23, then bulls can own the stock. Over this vital mark and bulls can aim for the recent highs near $25. They can bail on a close below $22, which gives them an attractive risk/reward. Time for some good news, and we have it with PayPal (NASDAQ:PYPL). Despite beating on earnings per share and revenue expectations, PYPL stock is down slightly on Thursday. However, $86 support held just fine, showing that the mobile payment platform is likely in a new range. The prior range between $70 and $86 was in place for some time. Until PYPL breaks below $86 though, there’s little reason to get too bearish on the name. Bret Kenwell is the manager and author of Future Blue Chips and is on Twitter @BretKenwell. As of this writing, Bret Kenwell was long T and GM. Article printed from InvestorPlace Media, https://investorplace.com/2018/07/5-top-stock-trades-for-friday-uaa-ua-fb-f-pypl-rtn/.